During Lent, the vast majority of men today do not take time to reflect upon the sufferings and death of Our Lord Jesus Christ. To counter this sad neglect for Our Lord’s Passion, America Needs Fatima has launched a bold new outreach program to spread free compact disc recordings of The Way of the Cross to tens of thousands of families. 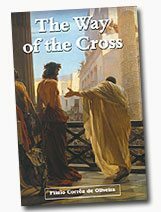 Professor Plinio Corrêa de Oliveira, the inspirer of the TFP family of souls worldwide, wrote The Way of the Cross, which contains a series of meditations. Many readers were profoundly moved by these meditations. Some people even consider this Way of the Cross recording as the most inspiring version of the Passion they have ever heard. For example, in the Sixth Station of the Way of the Cross, Professor Corrêa de Oliveira mentions Saint Veronica in these terms: “One would say at first glance that never was there a greater reward in all of history. Indeed, what king ever owned a cloth more precious than that veil? What general, a more august banner? What gesture of courage and dedication was rewarded with a more extraordinary favor?” Richard Fatherly, whose voice is considered one of the best of its type in the industry, records this Way of the Cross on a compact disc. The background music used to enhance the beauty of the meditations is from the best classical composers. This entry was posted in Events of 2005 and tagged Passion of Christ, Plinio Corrêa de Oliveira, Way of the Cross by Robert Ritchie. Bookmark the permalink.